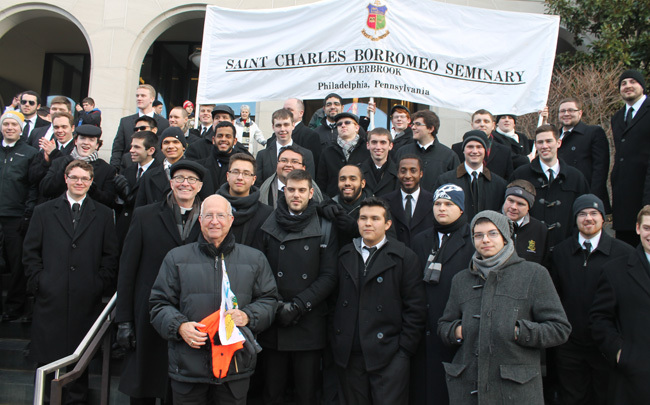 A large group from St. Andrew Parish in Newtown, Bucks County, pauses during the March for Life in Washington, D.C.
Seminarians from St. Charles Borromeo Seminary in Wynnewood gather with their rector, Bishop Timothy Senior (front left, with cap) and Bishop Herbert Bevard (right of Bishop Senior, with flag), who is an alumnus of the seminary, a former priest of Philadelphia and currently bishop of the Diocese of St. Thomas in the U.S. Virgin Islands. 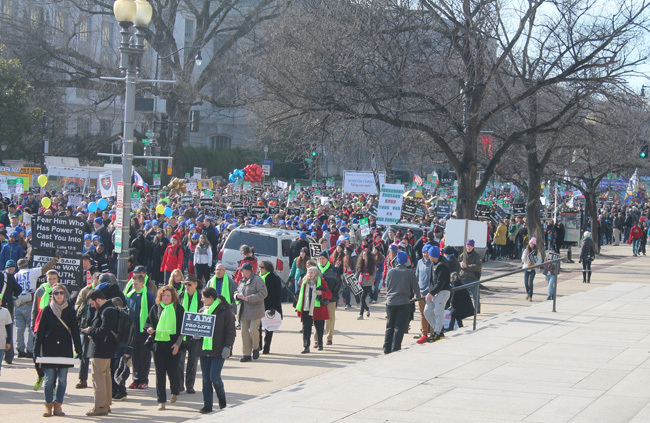 Participants in the march, including a contingent from the Archdiocese of Chicago, proceed along Constitution Avenue toward the U.S. Supreme Court building. 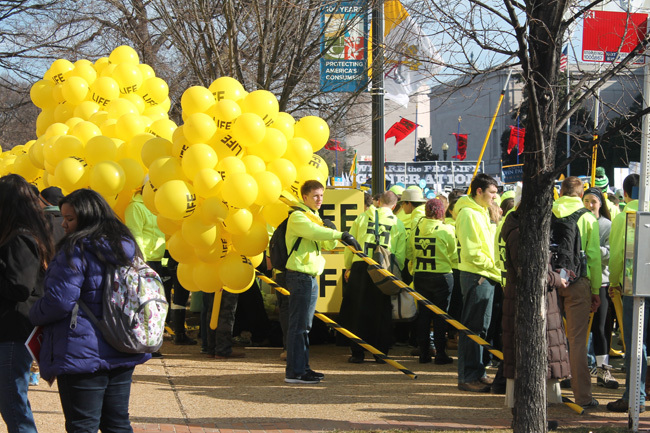 Young people get behind the pro-life banner — literally and figuratively — in the cause of promoting the sanctity of life. 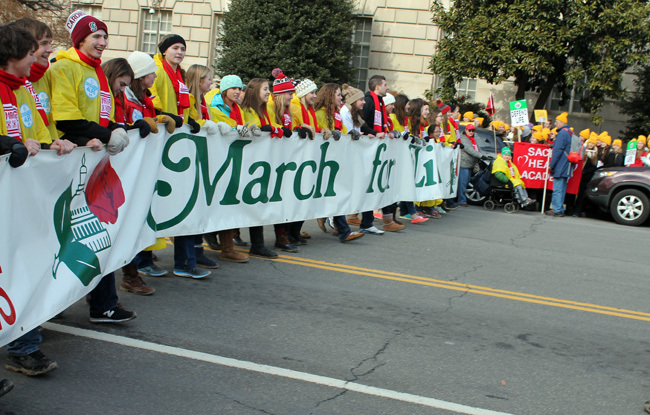 The U.S. Capitol looms behind a group of energetic marchers from Lansdale Catholic High School along the route toward the Supreme Court building. 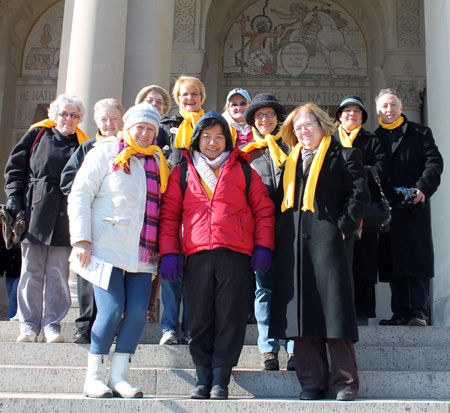 A group from St. Stanislaus Parish in Lansdale gets ready to step off for the march after Mass at the Basilica of the National Shrine of the Immaculate Conception in Washington. 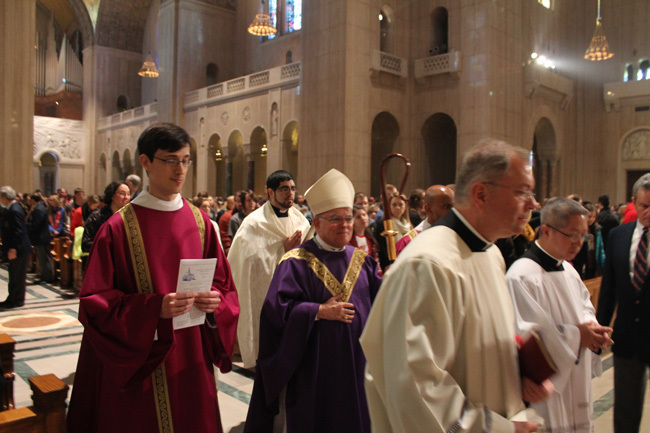 Archbishop Charles Chaput processes into the Basilica of the National Shrine of the Immaculate Conception, where he was the principal celebrant for the morning Mass with Philadelphia pilgrims and others Jan. 22, preceding the March for Life. 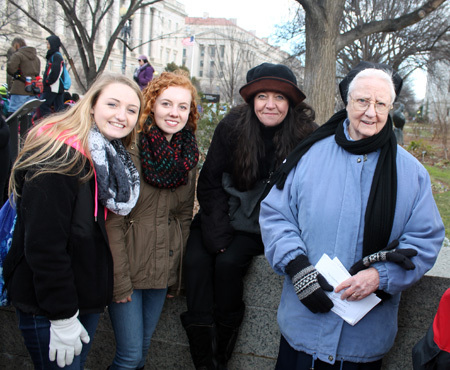 Sister Regina Bernardo, I.H.M. 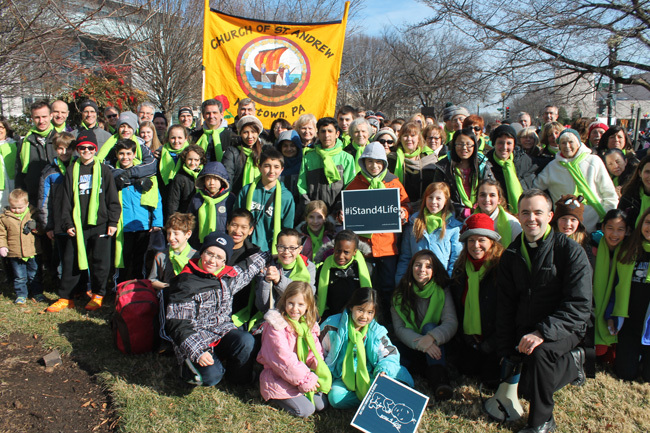 (right), poses with parishioners of St. Agnes Parish in West Chester during the march. 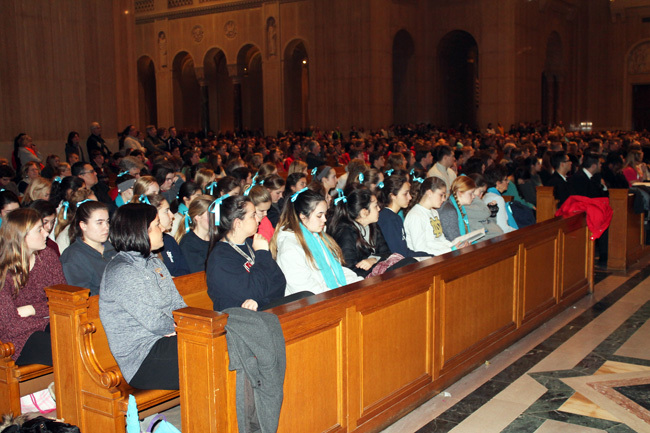 Students of Merion Mercy Academy pray during Mass Jan. 22 from pews in the front of the Basilica of the National Shrine of the Immaculate Conception. 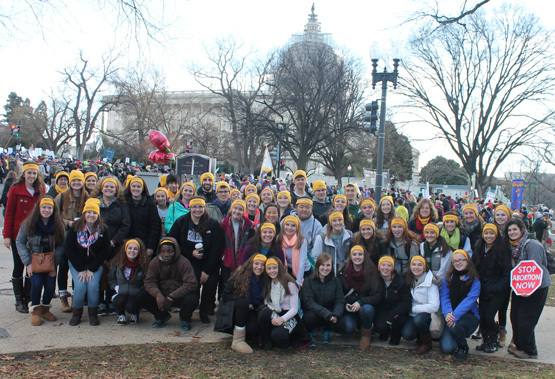 A contingent from the Archdiocese of Chicago brings a splash of color in the form of bright balloons at the annual March for Life Jan. 22 in Washington, D.C.
Great pictures – it was exciting to be in the presence of so many pro-lifers!